There's plenty of good reason. Yes, really. 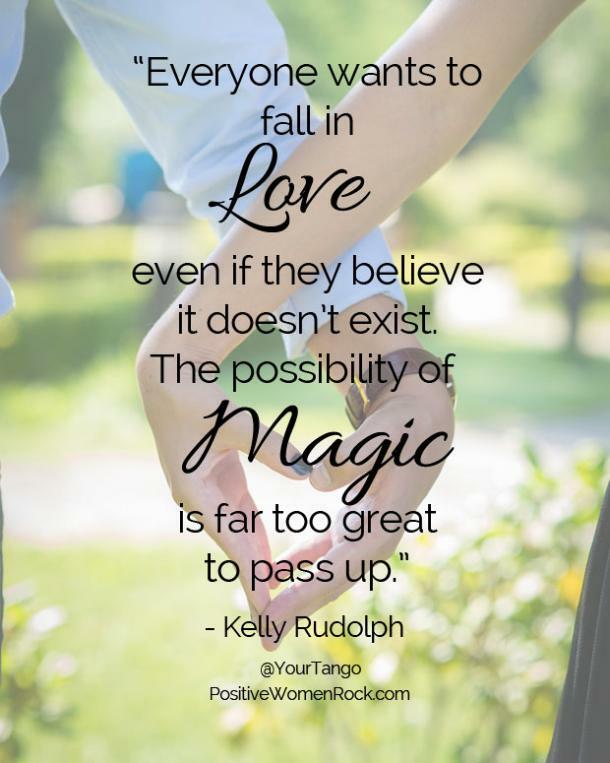 Falling in love is the ultimate life experience! When you begin dating someone new, you feel deeply connected, important, confident, and excited about your new adventure. Even if past heartbreaks have left you in fear of emotional intimacy and maybe even questioning whether love really exists, the possibility that you might find out what true love means in this relationship makes you optimistic again anyway. Or … is there something more going on? Yes, I think there is, and YOU need to know about it. On the surface, being part of a forever couple is the plan for most of us. Growing through life with that solid foundation of someone who has your back is the dream. Unconditional love sounds like paradise, and feeling important to someone who appreciates you for who you are is bliss. But beneath the surface, there’s a powerful drive to get something else accomplished. Humans have four basic psychological needs that must get met every day. Falling in love gets all of them met at the same time. While this one-stop-shopping solution sounds perfect, it creates a slippery slope that all too often leads to breakups. It’s very easy to fall for the wrong person or the wrong kind of person to get your needs instead of a because you make a promising couple. Let’s be scientific for just a minute so you can fall in love and be cherished instead of heartbroken. Deal? You have probably noticed that when it comes to relationships, when your emotions jump for joy, your brain cells seem to go on vacation. Before you know it, you can be deeply involved with the wrong person. That's because your psychological needs are getting met and it feels amazing, just like love. All humans are born with two fears: the fear of loud noises AND THE FEAR OF FALLING. Yet we continuously look for ways to “fall” in love. And it can be as dangerous as any other fall. So, let’s ensure you know how to fall for the right person and give yourself the best shot at a successful relationship. Your four basic human psychological needs are connection, significance, certainty, and variety. Falling in love with someone who feels the same way about you gets each of those needs met, but it also puts too much pressure on the relationship. A pressure-cooker-relationship is un-survivable, and putting the responsibility for meeting all of your needs on someone else is a recipe for disaster. Getting these needs met outside of your relationship will give you more confidence, and that will magnetize a healthier, more confident partner. If you attract an insecure one by accident, it’s no accident. It’s a test. Pay attention, learn the lesson, and exit before they drag you right out of your confidence. First, you need a spiritual connection to feel truly stable. You have four bodies — mental, emotional, physical, and spiritual. Most people either forget the spiritual one, or purposely ignore it because they got burned out on religion as kids, but when I refer to your spiritual connection, I’m referring to your SPIRIT, not necessarily anything associated with religion. God, Source, Spirit, whatever … find or nurture that connection. This is the way to stay connected to something bigger than yourself and which always has your back. You also must develop a healthy relationship with YOU. You need to know who you are inside and out. Know your passions, dreams, values, deal-breakers — everything you would want to know about the person you fall in love with. Additionally, emotionally healthy friendships are vital connections that contribute to a healthy relationship, as they keep you connected. You can feel very similar love feelings for your BFF’s. Keep each other accountable to be good to yourselves so no relationship destroys your confidence or friendships. If you have healthy family ties, great! If not, your best friends are your family of choice. Just. Be. Connected. Outside of your romantic relationship. Significance means you feel important, so avoid your relationship being the only place you feel this way. Friendships and family can meet this need. Have something in your life where you feel necessary, whether it’s volunteering or work projects, inspiring people to laugh, or caring for someone who needs connection. Certainty is another of your psychological needs that must get met. This is one reason many people cheat but stay married. To be sure your certainty is met in a healthy way, ask yourself, "What am I sure about?" If you’ve nurtured your spiritual and friend relationships as mentioned above, these can be your solid foundation. You will still have them just in case the love you fell for isn’t always perfect. And having certainty before you fall in love, makes you all the more desirable because of your energy and confidence. Variety is a fun need to get met, but can prove challenging in a long-term relationship. That makes it even more important to get met on your own in a healthy way. Have a variety of things you like to do, read, watch, listen to. Discovering new places to go, people to see, and things to eat can be helpful when you do fall in love. Having this and your other needs met grows your confidence — the most sought-after personality trait in a partner! Now you know why everyone wants to fall in love, even if they say they don't believe it exists. It does ... and you can get your own needs met and fall in love for the right reasons with the right person. YOU deserve it! Kelly Rudolph is founder of PositiveWomenRock.com. She guides women to clear self-sabotaging emotional baggage from the past that drags them down. Want a fresh start with a clear head and an open heart? Connect with her and get her free Life Strategies now.